Italian rapper and songwriter, born 18 July 1969 in Turin. In 1992, he toured Italy sharing the stage with Run DMC and the Beastie Boys. His songs talk about mafia, racism, and terrorism. 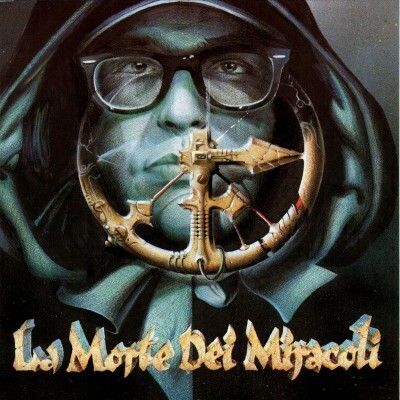 “La morte dei miracoli” is one of the italian Hip Hop masterpieces. With his high-level language, complex rhymes, refined and creative metaphors, Frankie created a deep album, supported in four tracks by the outstanding producing and composing abilities of Ice One (one of the greatest italian producer), that produce the national hit “Quelli che benpensano”. Please notice that the last track is really the 69th track of the album. Between the track 14 and 69 there are 55 empty tracks: basically is a big joke. If you don’t understand the language, this is probably a hard-to-listen cd. But it’s great Hip Hop, believe me. 1 comment "Frankie Hi-NRG MC ‎- La Morte Dei Miracoli (CD) (1997) (FLAC + 320 kbps)"